Part I lists a few of the regularly-occurring social dances in the Williamsport area. 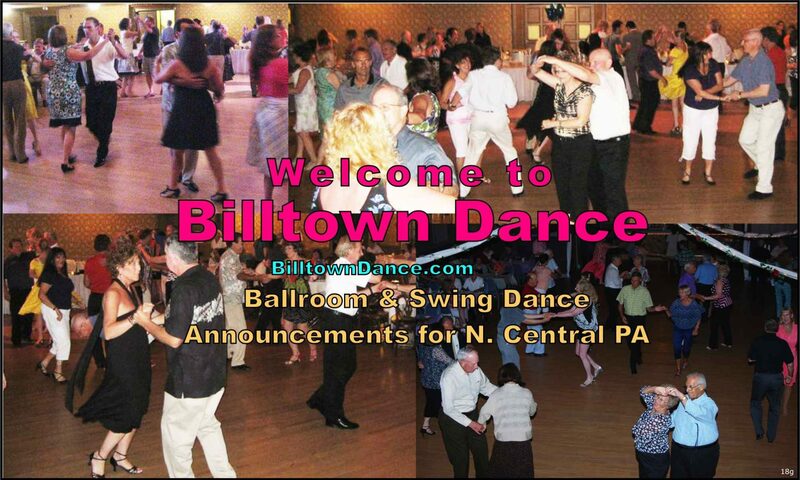 Part II lists some additional dance contacts (dance groups and instructors) in and near the North-Central Pennsylvania region. Last Saturday: (4th or 5th) Pine Street United Methodist Church, Williamsport. See the “MahoneyNet” Yahoo group email announcements for dates, details, plus many additional dances. ORDER of groups listed: This list is ordered (loosely) from West to East, then south to Freeburg. Note that groups further east are listed on ScrantonDance.com . Williamsport: Gary & Bonnie Glidewell dance instruction, GaryAndBonnie.com . Operates in conjunction with Saint John’s School of the Arts. Williamsport: Mimi & John Troisi, MimiAndJohn.wordpress.com. These instructors are retired, but their website has many instructional videos. Williamsport LINE DANCING: Double S Corral LINE and Couples Pattern Dancing, operated by Rusty & Sharon Sechler, facebook.com/hepburnfirehall.linedancing (note you cannot see the current schedule, unless you are “friends” with this page). This group is approximately 80% line dancing and 20% couples pattern dancing.
. Nate F’s ‘Central PA Line Dancing‘ Youtube Video shows a typical evening. Catawissa – Denny Starr hosts line dancing at the Cracker Barrel Bar & Grill (not the national chain), beginners Wed night & advanced on Fri night. Denny has no online presence, but info is on bar’s Facebook at facebook.com/catawissacb. This group is approximately 80% line dancing and 20% couples pattern dancing. HISTORIC ARCHIVE: The older ‘Track2 DanceNet’ list of ballroom groups at track2.com/dance/ballroom.north.shtml has more details and photos, but much of the information is outdated. DanceLiteracy.com has links to how-to Youtube videos for single-step swing, triple-step swing, and waltz. The SinglesDances.net website lists singles groups. Note that almost all the groups in the NC PA region have ceased operation. HISTORIC ARCHIVE: The older ‘Track2 DanceNet Singles’ page at track2.com/dance/singles.contacts.shtml shows earlier singles info.